In the mountains to the west of Madrid, lies the little town of San Lorenzo de El Escorial. The town houses a huge monastery and palace, built by Felipe II is the 16th century. As it is easily reachable by cercanias from Madrid it makes a nice daytrip for tourists and Madrileños alike. 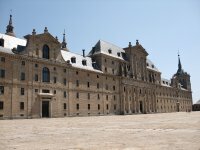 The huge complex was built between 1563 and 1584 the construction of the complex was trusted to Juan Buatista de Toledo and later to Juan de Herrera. During the building period, the King himself kept a close watch of the progress of the project, and invited the best artists of that time to contribute to the complex. Besides being a monastery and a palace, it is also a mausoleum. It holds the remains of most of the Spanish royals that ruled Spain during the last 5 centuries. The complex can be visited from October until March from 10:00am to 5:00pm and from April until September from 10:00am to 6:00pm. Some parks and parts of the complex are opened a bit longer. At most of the national holidays the complex is closed, to be sure it's best to check the website of Patrimonio Nacional. There are several options for a visit to the monastery. A free tour costs €8, but will exclude you from entering the Pantheon of Kings. Alongside the free tour you can rent a audio tour for €3, in several languages, with this audio tour, you can enter the Pantheon of Kings. A guided tour with a group will cost €10, and also includes the visit to the Pantheon of Kings. On wednesday access to the monastary is free for EU citizens, but only limited to the rooms covered in the non-guided tour, so excluding the Pantheon of Kings. There is a whole list of discounts and combined tickets with the sights at the Valle de los Caidos, if you want to check if you are eligable for one of the discounts, check the website of the patrimonio nacional. The first part of the tour excists of two rooms in which hang a couple of old tapestries. The architecture museum tells about the built of the complex. It shows a couple of models that were used. Confusingly it also shows maps of other monastaries. In a passage way away from the rooms where the maps and the models are, you can find the materials, machinery and tools that were used during the construction of the monastary. The Gallary of Paintings is housed in the former Summer Palace of Felipe II. Felipe II was the owner of a huge art collection. Parts of this collection were passed to him after the death his father, but he was also a keen collector, and he commisioned a lot of works. There are works on display from several Italian masters (Titian, Veronese, Giordano, Tintoretto) and Spanish masters (Zurbaran, Fernandez Naverrete, Ribera, and ... of course El Greco). But there is also work to be seen from Flemish painters. A couple of the rooms are still in the style of how they were more than 400 years ago. These rooms are named the Habsburg Apartments, others were remodeled during the reign of Charles III, and are now refered to as the Bourbon Apartments. In the Habsburg Apartments is also the Room of Felipe II, which is kept like it was when he died in this room on September 13, 1598 at the age of 71. The room lies at the back of the Basalica, and it is said that from his bed Felipe could see the high altar of the church. In the Bourbon Apartments the art collection was extended with works of Goya, Castillo and others. The Royal Pantheon of Kings is the burial place of the Spanish Kings from Charles the V (Or Charles I of Spain) until today. In the original plan Felipe had meant to build El Escorial partly as a mausoleum for his father but it ended up as the burial site of all the monarchs, and their fathers and mothers, who didn't become King or Queen. There are 26 sepulchers at the Pantheon of Kings, and they are all filled or reserved. Next to the Pantheon of Kings, is the Pantheon of Princes, the last resting place of other members of the houses of Bourbon and Habsburg. This Pantheon was built on the initiative of Queen Isabel II. It consists of nine rooms and was completed in 1888. In most of the rooms white marble coffins are alined next to eachother. There is one smaller room with the coffin of John of Austria, which has a statue of him, holding his sword on top of the lit. Another room holds the remains of the young royals that died before the age of puberty. Their remains are inside a huge white marble tomb with three layers. Close to the Royal apartments were the Chapter rooms. There were used for meetings. On the walls of these rooms are master-pieces by Bosch, Titian, El Greco Velazquez and others. A couple of rooms are kept as they were, so visitors can have an idea how they looked in the days they were used. The Old Church is also referred to as the borrowed church. When the construction of the monastary was started, the people working needed a place to hold the mass. As this room was amongst the first to be finished it was transformed into a Church. Nowadays this church is used for the burials of the monks that are living at the monastary. The lower part of the cloister is a beautiful decorated hallway, surrounding the patio of the Evangelists, with frescos made by several artists. The main staircase is a master-piece. The walls, a fries, and the ceiling are done by different artists and with different themes. The frescos on the ceiling were done by Luca Giordano, and is called "Glory of the Spanish Habsburgs". The staircase leads to the monastary, which can't be visited. The Basalica is the center of the complex. From the courtyard of Kings you have a great view of the front of the church. 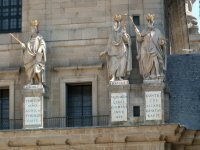 Two towers were built on either side of the entrance, and above the entrance are sic statues of Kings. Juan Bautista de Toledo had previous experiences with building the dome of the St. Peter in Rome and it has influenced the design of the dome of the Basalica at El Escorial. The church has several chapels with relics and paitings. The main altar has several paintings at the back end. On the sides are groups of bronze statues, depicting Charles V and Felipe II and their families. 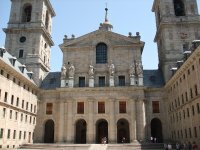 For the paintings surrounding the altar the King wanted the help of either Titian or Michelangelo, but both masters were getting old at the time El Escorial was built and declined the offfer. As a result several lesser painters worked on the painting at the altar. One the most important libraries in the world can be found at El Escorial. It holds 45,000 books from the 15th and 16th century. Most of the works come from the private collection of the King. But he also bought several collections to be added to the Library. Besides the books there are also around 5,000 manuscripts in Latin, Spanish and Arabic. In the middle of the room there are a couple of globes, and a model of the solar system, with the Earth as the middle. The books are stored on to beautiful carved wooden shelves. The guilded books are stored with the pages facing outward so they won't damage the spine. The walls and ceilings are decorated with frescos painted by Tibaldi, depicting the seven liberal arts: Rhetoric, Dialectic, Music, Grammar, Arithmetic, Geometry and Astronomy. From Madrid the Cercanias (Commuter trains) go to El Escorial. You can take trains at the major stations in Madrid (Atocha, Nuevos Ministerios and Chamartin, at the moment there is no direct connection from the new station at Sol.) Take the C-8 line, but be aware that this line splits at Villaba. Half of the trains go to El Escorial, the other half go to Cercedilla. From Madrid you can also take the C-10 line, and make the change in Villalba to the C-8 to El Escorial. The stopover time is about 15-20 minutes. The ride takes just over 1 hour. From Madrid the A-6 motorway, that goes in the direction of Segovia and Valladolid. At las Rozas you can swith to the M-505 (junction 18), which lead to San Lorenzo de El Escorial. If you miss that junction you can continue to Torrelodones (junction 29), take the M-519, which will lead you back to the M-505 at the center of Galapagar. There are parking space opposite the main entrance, on the northside of the complex, but parking there can become pretty expensive, if you plan an extensive tour of the monastery. From Madrid busses leave at the busstation at Moncloa. If you arrive by train in San Lorenzo, you can take the number 1 city bus, which is waiting on your left, when you exit the station. In the Monastery there is a cafeteria were you can have a drink or a small bite. For a serious lunch or dinner it is better to wait until you finish the tour, and go for one of the many restaurants, one or two streets away opposite the visitors entrance. This is version 29. Last edited at 1:49 on Mar 27, 12 by Peter. 4 articles link to this page.